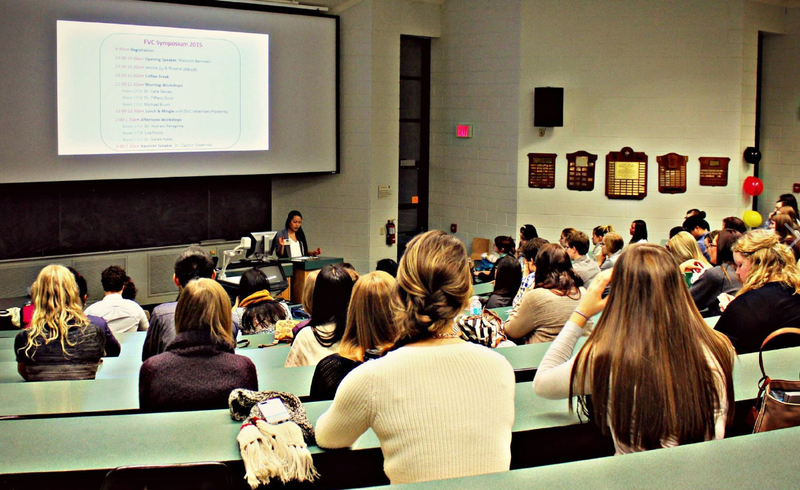 The Ontario Veterinary College hosted the 3rd annual symposium of the University of Guelph Future Vets Club which explored topics related to the impacts of human-animal interactions. Speaking of Research committee member Michael Brunt was invited to speak about embracing the human-animal bond in research. The one day symposium offered a diverse selection of human –animal topics including medicine, parasitology, research, wildlife, epidemiology and animal welfare. Michael presented a lecture discussing the importance of the human-animal bond that develops with research animals. The 50 delegates in attendance were provided with background on why animal research is necessary as well as the debunking of several myths commonly perpetuated by animal rights groups. An extensive list of myths can be found on our “Animal Rights BINGO” post. People that work with and care for research animals love animals. They treat them with the compassion and respect they deserve and provide them with the highest quality of life while they are with us. Further reading can be seen on our previous posts “Why I Became an Animal Technologist” and “Why I am a Laboratory Animal Veterinarian”. The lecture offered an opportunity to present accurate information about the use of animals in research and further productive discussion surrounding this important issue. Many members of SR are involved in outreach. Please contact us if you are interested in having someone speak at your institution or conference. Posted on February 20, 2015 by EditorPosted in News, Outreach News, SR NewsTagged Future vets club, Michael Brunt, Ontario Veterinary College, University of Guelph. I once worked at a cancer research lab as a typist. The staffers knew all the animals by name, their relationships, etc. On the occasion when an animal had to be sacrificed, staffers were sad and some cried. They did their jobs, but the cared deeply for the animals…which were hamsters.